SF Taxi Media: The SFO Distance Based Short. By John Han. SFO Taxi Lot. Photo by John Han. I must say I was aghast after hearing some of the complaints SFO says it gets from customers taking taxis from the airport, (i.e. - driving 95 mph, reckless driving, dumping passengers off on the street, or somewhere besides their destinations in order to get back on the freeway quicker – just to name a few). These are atrociously unacceptable, as bad as “Boycott Paratransit” or even worse. SFO is not to be blamed for considering enforcing some changes. In fact, I support the idea of changes. But the airport must address this problem in a way that doesn’t look or feel as if it is lashing out at cab drivers in revenge for misconduct. And that is how the ‘elimination of the short line’ with a ‘minimum fare proposal’ looks and feels like to many drivers. Since new changes seem inevitable, it’s necessary to first identify the key problem. SFO’s first priority with regards to its passengers and taxis is safety, and customer service and satisfaction. Both of these priorities are seriously harmed by the time rule. But it’s also equally important to identify what the problem is not. The problem is not the short line itself, but a short line that is dependent upon time. Airport officials must consider that it now may be appropriate to finally implement a version of the distance based short that many drivers say they support. Airport officials have rejected ideas similar to this before, saying they would have to hire additional starters and that would cost more money. Some drivers have also rejected this idea claiming that the starters are “incompetent”, that they can’t even do the jobs they’re expected to do already, much less do more, like ask customers where they’re going. If the latter’s true, then part of the problem is the starters, and SFO should fire the bad ones, and hire new ones with a stricter screening process. It is not unreasonable to expect that a starter be capable of asking all customers their destination and issue short tickets to the proper people. SFO doesn’t have to hire an additional number of starters. It could retrain the ones it already has, or replace ineffective starters with good ones. Customers do not need to be divided into separate short trip lines and long trip lines at terminals, thus confusing the process. It only needs to retrain or hire new starters who would be capable of asking customers who are formed in single lines what their individual destinations are. Customers going to short trip cities get short trip tickets. Those on long fares don’t get short trip tickets. They just get shown to their cabs. It’s pretty easy. Naturally, there will be the fear that starters who have rolls of short tickets in their hands will get friendly with some drivers, and invent a hustle for short trip tickets sales. This is likely if the penalty for getting caught is held to a mere slap on the wrist. But if the penalties were severe, such as fines into the thousands of dollars, and a prosecutable offense punishable with jail, or fines and jail… that ups the ante. 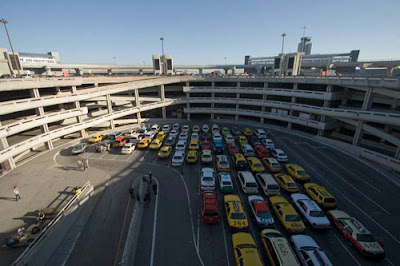 As an incentive for the airport to support this plan, SFO should be allowed to eliminate the subsidy that taxi drivers currently enjoy with a short ticket re-entry. The airport should receive $4 for every entry and re-entry back into the lot. Drivers should be able to split the cost with customers, thus bringing the actual costs to $2 or less per entry. If drivers by and large could be persuaded to accept this, it should help drivers incomes, while significantly increase airport revenue, and SFO may see itself as also financially benefiting from this plan. All these years, SFO's been losing money on shorts. Drivers no doubt will be furious over losing free re-entry with a return from a short trip. Why should they support paying more money in fees without something to compensate? They are already working hard for a little bit of money as it is. SFO should expand the territory of short trips in return. My recommendation is to include any location within these cities as designated shorts… Brisbane, Daly City, Colma, South San Francisco, San Bruno, Pacifica, Millbrae, Burlingame, Hillsborough, and San Mateo. Foster City should be seriously considered as well. Under this plan, SFO would not lose money due to increasing the shorts. It would make more money, while being able to vastly expand the short territory for drivers. This plan would enable SFO to be more generous toward drivers in what it considers a short trip. For example, if I paid a $4 re-entry fee each time, I could have, in return, San Mateo, and possibly Foster City as a guaranteed short trip. Each side gives a little and gets a little. Drivers, if you paid more, you could get more. Under this plan, SFO would be able to collect more in revenue, and drivers, in return, could get a greater territory of shorts… and with no time limit! I hope everyone would see the possibility of this as a win/win situation. And, it eliminates the incentive to speed. So drivers could take a trip to San Mateo, grab some lunch, and still return with a valid short ticket. This is the best part! In other words, it’s good for the same amount of time as a typical shift. Here’s why I think the 10-hour time window is so important. Suppose I waited 90 minutes in the lot. If my first ride is a short to Millbrae for say $13.00, then I can return fairly quickly. I pay a $4 re-entry bringing my revenue down to $9. That’s frustrating. But I use my short. But say the next ride is another short to South San Francisco… a would-be designated short trip. If after I’ve dropped off and cleared the meter, suppose a GPS call is dispatched to me and it’s in the Outer Excelsior. If I were in the right parts of South San Francisco, I would be in position to take that call, and with a 10-hour short, it would be possible. Now, let’s say that the passenger from Outer Excelsior is going to work at Fisherman’s Wharf. I take them to Pier 41 and from there I pick up tourists wanting to go to the Golden Gate Bride. I bring them there, and head back and pick up in the Marina somewhere. From there, what if they’re heading to Noe Valley? That would put me back into position to jump on the freeway and head back to SFO and use my short. I would have had all those rides, and not have to give up my short. Or what if I got even luckier and someone was going to SFO, and I still had my short ticket? Are you seeing the possibility? An expanded territory with a 10-hour time window vastly increases a driver’s income. If drivers could handle paying the $4 every time, it could yield a valuable return. In the above hypothetical example, what if my ride from the City to SFO happened at the end of my shift and I didn't have time to use the short ticket. That would probably be rare, but what if? I could decide to cut my losses on the short, figure I had a good day anyway, and head back to gas up. If I see a fellow driver starting out on the night shift, why shouldn’t I give my short ticket to him or her and make their shift start out on a great note? That way, that driver would have the remaining hours left on the ticket and could use it. And I did a good deed. Since it’s already been paid for, someone should benefit from it, whether it’s myself or someone else. It wouldn't negatively impact other drivers. Needless to say, eliminating a time-based short is going to immediately address the safety and liability concerns associated with time-based shorts. This should be SFO’s chief concern. Under this plan, SFO would actually increase its revenue intake while adequately addressing the safety and customer service issues. At the same time, it would be able to extend generosity and outreach to low-income drivers. It would allow drivers to have an increased territory of short trip cities, with no time limit, which would help them make more money. No more racing on Hwy 101 and all the problems that are attached with that… just improved service for customers, more money for the airport, and more money for the drivers. I hope this is something other drivers would agree with, and airport officials as well. It may be important to point out that much of the success of this plan would depend upon the starters... their ability to adequately ask each customer their destination and issue tickets accordingly, even during peak times when the airport gets slammed. All too often, cab drivers get blamed for things that other industry people should be taking some of the responsibility for. The starters need to be able to do an adequate job. This plan should be tested as a pilot program for a limited period, and studies should reveal whether results show a decrease in customer complaints on service and speeding. Results should also indicate whether drivers like it, and if the airport can manage it properly. Hope this helps. And thank you for reading my blog. Interesting idea, John. One thing, though, that defeats the advantage (for a driver) of the short line, is when the short line is, like, 47 cabs! Which it might more often be, based on your expanded "short-authorized" area. Hi Buzz, it's possible. I get the feeling something like that would work itself out though. It's likely that the short line could get longer and so it would take longer to get through. But drivers would also gain a greater territory to use as shorts. And so, waiting times and distance could be proportionate to one another. Longer waits in the short line, but greater distances could equal more money proportionate to the wait times. Drivers could likely earn at least the same from playing the airport that they are now, without the stress of racing back on a time based short. But possibly they could earn more. And with the change, the airport will have dealt with its serious problems associated with time based shorts. It may be a matter of drivers adjusting to a new dynamic of playing the airport that will be different than what they're used to, but works just as well. But if drivers felt this plan would cause an overwhelming backlog in the short line, they must arrive at a consensus on how to properly administer a short line based on distance. SFO has been pretty strong and clear that it doesn't want a time based short anymore. SFMTA is backing up that view. Some drivers want to see the shorts eliminated. But if you want to see shorts stay, I say take it the way it's laid out in this plan... or at least something similar to this plan. UTW has a variation of this idea of distance based shorts, as well as SFCDA. Otherwise, SFO may eliminate the shorts altogether. I liked your idea until you got to the last part. Simply too complicated. The best solutions are always simplest. Your ten hour scenario is also a bit iffy but it brings up an interesting point: is it possible to have a short that isn't in some way time based? My original idea was to have zero time limit. It would work, except that to many people it's such a foreign concept, and it represents such a different approach. They could do something like a one month expiration date... or one week, or 24 hours from the time it was stamped. Everyone is parroting SFO's line that the short line is dangerous because drivers go 95 mph. How many drivers? One newspaper article citing this outrage was based on a single incident in which it was claimed the driver did the run at 95. Isnt the usual procedure when you want to solve a "problem" that you first identify the problem? So far I've seen no figures at all from anyone regarding whether or not there has been a single accident caused by a driver speeding to make a short. The airport management is going to say whatever it wants that it figures will fit its agenda, which is, mainly, making as much money as it can, even during this recession. How about a few facts for a change? You're right, we should get a hard copy from airport management documenting the complaints that they say they've received... how many, and what types. Some drivers may already have that but I'd have to ask around. My info came in the form of spoken claims by Henry Thompson, Assistant Deputy Airport Director Operations. During a conversation at the airport during the summer, Thompson claimed that the airport received lots of complaints of drivers speeding and driving recklessly, and dropping passengers off on the side of the road near freeways, instead of deeper into downtown to requested hotels. Though no accidents related to shorts have been documented so far, Thompson said airport attorneys are concerned that, if even one were to occur, the airport could be considered liable in a lawsuit because the short system entices drivers to speed. If this is true, then the problem has been identified... it is the 'time based short' that's enticing people to speed. That is why people trying to save the short have been pushing for a one that's based on distance instead. But if the airports claims are bogus... that it really hasn't gotten those kinds of complaints at large, then you're right, and we deserve to know. You've made a good point, we get more facts submitted by the airport.